lies outside of Tulamben Bay, just around the headland from the Drop-Off. This dive site is accessed by boat from Tulamben Bay, but this is no ordinary boat dive! Fishermen from the village take divers out in a Jukung - a traditional Balinese outrigger canoe. Leaving from the beach adjacent to the Drop-Off, the journey is a pleasant 5 minutes with views back to Mount Agung and the surrounding coast. The real experience is at the dive-site, putting on equipment in the confines of a narrow canoe. The boatmen are great helpers and very quickly you are descending to the edge of a steep rocky reef. 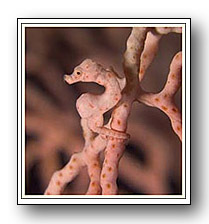 Gorgonia fans and soft corals sprout from large ridges and rocks that are spread along the reef face. Pelagic fish parade past and many reef fish meander around the corals. Depths start at six metres and continue way beyond scuba diving limits - watch your depth gauge. At the end of your dive be prepared to remove your dive equipment and climb back into the Jukung.